The other day we were just about to step onto the pedestrian crossing, when I noticed the TC (Transport Canberra) bus leaving the bus stop on the other side. The drive looked at us, and then gunned it; he raced onto the crossing and over it before we had walked too far. There was no danger at the time. The unfortunate thing is that this racing the pedestrian is not unusual at this particular crossing in Dickson (the one near the swimming pool). It is not unusual as you approach or even step on the crossing, to have a driver speed up to make it across before a pedestrian steps out. It is no longer unusual to cross and to end up looking at the rear of the vehicle as it departs. The other interesting habit that is now too common, is for the driver to wait till you have just passed the front of the vehicle, and then away they go – even though you are now in the middle of the crossing and with most of the crossing still to go. I think the worst instance recently was when I was just about to step out when I noted a fast approaching utility vehicle – being driven by a tradie and a mate. They made no attempt to stop but charged on through. A couple on the other side of the crossing and I shared a quick comment as we passed in the centre. I will leave it to you to imaging the tone of our comments. The hours before work and at going-home time can be very ‘interesting’ on this crossing. This is the time when certain drivers (a minority I hope) need to get to the destinations very fast and most likely they have avoided Northbourne Ave and so need to drive even faster. Apparently it is their right to insist that pedestrians step back and allow these anxious drivers to speed over the pedestrian crossing. Of course! But let’s not just pick on the drivers of cars and buses. A few months ago I was well over the crossing when I realised that I was on collision course with a cyclist. Her head was down and she was travelling reasonably fast. I stopped, stepped back and she closed in. She let out a gasp as she realised how close we were – but hey, let’s not fuss! Without any form of apology, she carried on at the same speed. 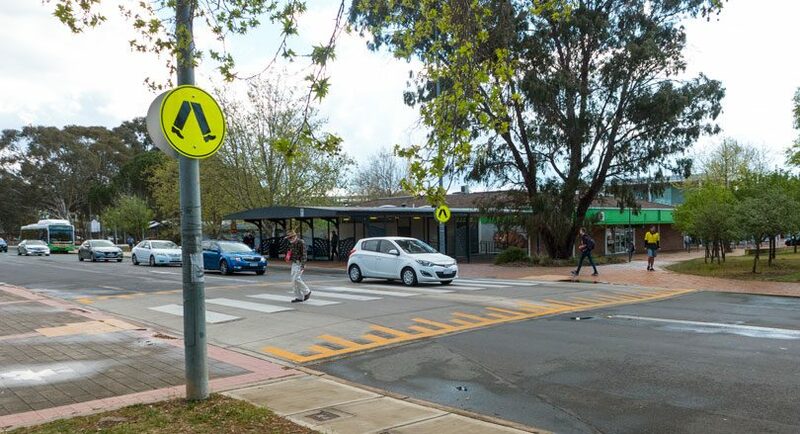 I do not know about other crossings in Canberra, but I must warn anyone crossing at this spot in Dickson that it can be very dangerous thanks to the few who insist that they have all the rights. This is not the only dangerous spot. Behind the shops, the smaller street (Dickson Place) that runs beside the nursery and then down along the Tradies Club to Cape Street, the speed limit is 40 KPH. People cross at several points. Alas – many cars do much more than 40, probably as a short cut. And watch out if you are crossing near the nursery and a driver coming up from Cape Street sees the lights are about to change. Many times, the drivers put that foot down and go for the lights – no matter what colour they are when they get there. As for any pedestrians in this shared zone – bad luck – you should know better than to even think that a car or a bus needs to slow down. One final story – and a sad one. A friend was knocked down on the new (badly designed) footpath outside the nursery. She was bowled over by a cyclist charging down the footpath. She hit her head on the concrete, and off to hospital she went. A cracked rib and damage to her head were the result of one person’s absolute lunacy in speeding on a metal machine into a place where pedestrians are coming across the street, getting out of cars and coming and going from the nursery. There many stories to tell about cars running red lights at the crossing near the nursery – but there’s not enough time for that here. Considering the dangers around pedestrian crossing and other places in Dickson, I do not think this is simply a law and order issue. Although maybe more frequent and very visible visits by the constabulary may at least put a message out there. I do instead think this attitudinal matter. There seems to be too many instances of people thinking that their needs and their ‘rights’ trump everyone else’s rights – or in many cases their safety. I wish there was an easy answer to how to change this. I now walk with a lot of care in and around Dickson watching constantly for vehicles racing across the pedestrians crossing, vehicles (including TC buses) that race the lights, and worse still have to now watch for cyclists on almost all of the footpaths – with too many (not all) driving straight at you as they demand right of way. Walking should be a pleasant and relaxing way to get about. But unless there is a miraculous change of attitude towards sharing open space, people need to be extra careful as you take that stroll. I don’t know about other areas across Canberra. It would be good to compare stories.